Perhaps the most important thing is a tube of hand cream. Garnier is my go to brand and they've yet to make one I haven't liked. 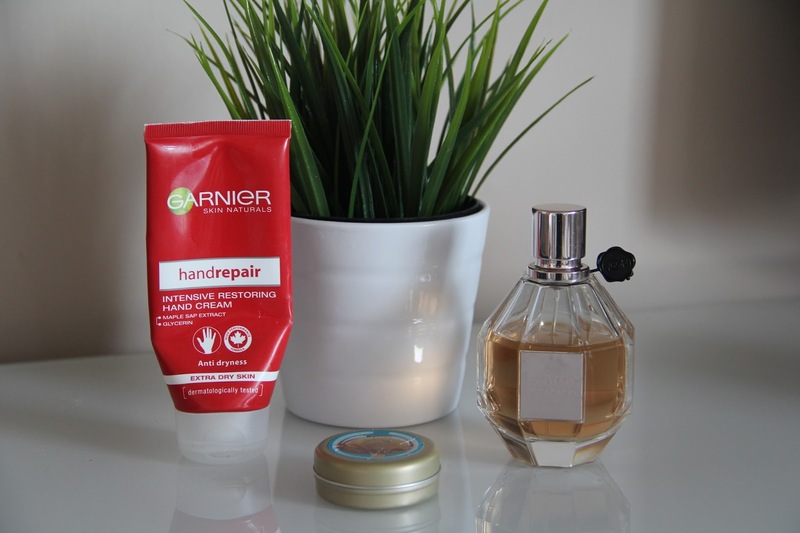 Right now I'm using their Intensive Restoring Hand Cream and it's truly transformed my hands. I use my hands a lot, both at work and home, so it's really important I look after them. I keep it at my desk to remind me to reapply. If I leave it in my car or bag I'll skip it, and my hands will suffer. Dry cuticles and cracked skin aren't something I enjoy so I'll always keep some cream by my side. Sticking with the hydration theme, I also keep some lip balm at my desk. I'm not at all fussy with regards to brand, just so long as it does the job. At the moment I'm finishing up a tub of the Body Shop's Wild Argan one. It's just ok, I love the scent but the balm is lacking ever so slightly. My lips are something I really do neglect. I'll apply balm in the morning and quite often, that will be it for the day. I know my lips need more than that, so keeping it close means I'm more likely to reapply . If I keep it up, I really notice a difference and matte lipsticks become an option again. By far my lips are my biggest beauty struggle so every little helps. Last but not least, I like to keep my current scent out too. Right now it's Flowerbomb and not only it the scent perfect, but the bottle is lovely too. While I keep it close to smell great, it's definitely eye candy too. I'm not saying I sit at my desk and spritz every hour, but sometimes it's nice to top up for a bit of a pick me up. As I rotate my perfumes, it's especially nice when I have one out that has memories attached. I've recently been wearing Miss Dior Cherie and it took me right back to prom with my partner. I love how scent can transport you to special times, does anyone else experience this? So yeah, that's what I keep on my desk. It's low maintenance to a tee, but my little edit takes care of what I actually need. I'd love to know if you guys have any beauty bits you like to keep at your desk. Am I the only one?